I received the mentioned products in exchange for an honest review. The thoughts contained within this post are mine and may vary from the thoughts of others. Recently I received 2 products from SmitCo LLC to review. I want to highlight them both in this review. They are also being added to the 2017 Holiday Gift Guide because I feel one is a great gift for any little girl in someone's life and the other is a perfect women's stocking stuffer! 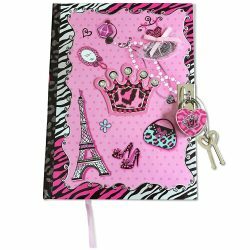 This adorable girls journal has 300 lined pages and is decorated in a fashion that any girl would love!! We think it is a great gift selection especially for the pre-teen but really any girl. I had one very similar when I was a girl and used them through the years. Knowing that I had a "secret place" with a lock and key to keep my writings made me feel so grown up. This diary is bound and made to last because it has a hard cover. I love that the outside features really cool 3D designs and other embellishments. I thought immediately that this would be an amazing gift for one girl to give a childhood friend or schoolmate in the coming holiday season. Also a great secret Santa gift for any young girl. Who wouldn't love a bright pink diary?? Get SmitCo LLC diary today! Next from SmitCo LLC are these amazing exfoliating gloves which have helped with dry skin season in our house SO much. I found that these aided in making it easy to care for the dry skin by using just plain old body wash, but I have other ideas up my sleeve, too. I am thinking this holiday season of making some scrubs and these would be perfect to apply them and add some extra exfoliation. These make great mail carrier gifts, stocking stuffers for your favorite woman or even gifts for women church members. I love that they come in multi-packs so I can buy several at a time and get the most bang for my buck. I am finding that these gloves are holding up better than others I have used in the past and the colors are brilliant! So at the end of the day I can knock several people off of my holiday shopping list in one spot using SmitCo LLC. I love when I can do that!! What are your favorite holiday gifting ideas? Feel free to share them with us as we are always scouring the internet for the best of the best! !